Johnathan Dane is the founder of the successful digital agency KlientBoost. 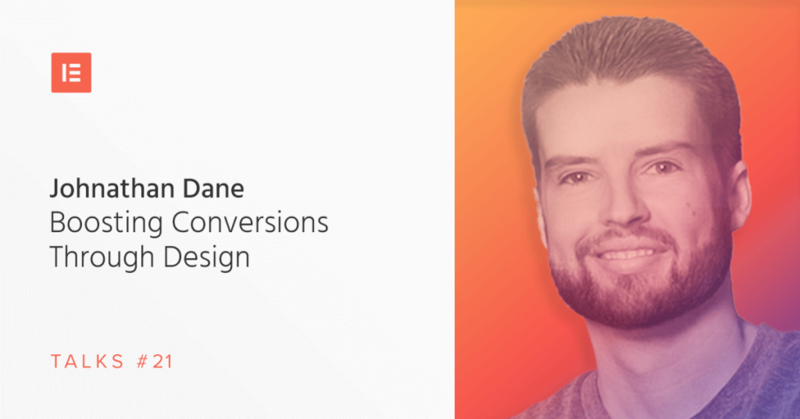 In our podcast, he illustrates the impact of design on conversion rate optimization, explains the Breadcrumb Theory, and shares how he hires new employees. Johnathan Dane is the founder of KlientBoost, a leading California-based creative digital agency specializing in pay-per-click (PPC) advertising and high converting, landing page design and testing. His passion revolves around analytics and creativity, which is also reflected in his agency’s work method. “Well, I’m half-Danish, half-American, came over here when I was 21 and wanted to finish my college degree. Learned about Craigslist and all the opportunity that it had from a marketing perspective, and things just kind of snowballed. And so, I’m 31 today, have an agency of about 55 people. I don’t feel like I’m young anymore. I feel like I’ve been in this game for a little bit now. How did Johnathan manage to set his agency apart from his competitors? “It’s funny because, I mean, you need kind of both to be a very dangerous combination in a good way. The funny thing is that most of the big wins and our big learning lessons almost always come from the design side. Like they always come from the conversion optimization side. And the reason why is, because that allows you to increase conversion rates. And when you increase conversion rates, your cost per conversion can be reduced, and your conversion volume can be increased. And that’s really tough to do within the world of pay per click alone, simply because you can change your bids, you can change your ads. But the actual improvements are so small but combined they can be a big deal. “So, it’s funny most of the time because there’s a lot of different parts of the website or the landing page, you mentioned copy. There’s layout, there’s the colors, there’s the sections, the hero image, and stuff like that. The biggest thing that we found, again and again, is what the call to action is and how it relates to the actual traffic and the intent of that traffic to convert. So, there’s a lot of differences between let’s say search traffic compared to display compared to social compared to video. And, within those, there are different types of conversion intent as well too. And then, what we also found is that there’s something called the Breadcrumb Technique that we follow too. So, imagine your traditional website based form, right? You usually have a name, email, and phone number. And what you’re taught to do is that the less the amount of fields you have, the higher your conversion rates will be. So, what happens in the downside of that is that, if you continue to remove your form fields, well, you’re left with the ones that you have to keep, which are usually name, email, and phone number. Yeah. To get in touch with the person, right? So, when a person that comes through your ad or anywhere from, email or organic, and they’ve seen that your form requires that and that is their first impression of you, there’s a very high likelihood that they’re going leave because they know that they’re not going to get an answer to their question because they have to give their contact information for somebody on your side reach out. So, what we’ve learned about is, again, something called the Breadcrumb Technique where you ask these pre-qualifying, anonymous questions in your form fields first. So, if it was you guys, for example, if it was us like let’s say the example would be, I’m a school, or I’m a college, for example. Well, I want to know what year you graduated high school and what you’re interested in. What degree are you trying to pursue? Right? Is it science? Is it math, and what are the specifics of that? “So, it’s funny, it sounds very ironic because we’re a paid agency, right? But the interesting thing for us is that we’ve invested in it and still do very heavily in our brand and very heavily in our content. I care more about creating evergreen value first, because as soon as you shut off those PPC campaigns, nothing is going to continue to give you any value. You can’t really say that for your blog. You can’t say that for your videos and things like that too. So, and if it was me and I would start fresh again, I would do the exact same thing that I started from day one, because we are now sitting on this snowball that keeps getting bigger and bigger for every blog post we publish. And you can’t say that with paid. I think it’s smart. I think you can do like remarketing to begin with, if you’re getting started, that’s a good idea. But I treat it as people who are running off to the next deal because they got to talk to their network or they got to ask for referrals. One, it’s super, super taxing to do that yourself if you’re the owner of the business, because don’t want to be focusing on sales forever. You want to be able to scale that and give that to somebody else, but they can’t talk to your network because they’re not you. Right? So, if I were to be anything and come with a recommendation, I would say invest in your own content, because it’s the only thing, I think, as things get more and more competitive, that’s going to separate you from everybody else. So, that’s just my two cents. “The thing that’s been the most value for us is, think of yourself as somebody who’s always trying to figure out what’s wrong with your own business. Like how are you, what we call auditing, and how are you always trying to make things better, and how are you trying to make progress? One thing that, in my college career, coming from Denmark over to the U.S., I think I ignored everything that I learned in school because it was just a lot of wasted time in my opinion. But there was one professor that I still have the note on my phone from when I actually took his class. And he says, success is the realization and the progress towards a worthy goal. And it doesn’t matter what you’re making a month, but what really matters is that you feel like you’re always making progress. I’ve had guru’s tell me that design isn’t important. That as long as all the technical stuff is in place you’ll be fine, but I like this article’s take on how optimizing design elements, especially conversion rate optimization. Thanks for the tips! Such a valuable article. I’m going to have to go through it a second time! Like the Breadcrumb Technique and that evergreen content continues to secure a reputable position in it all. Thanks for the solid insight. When is Elementor going to get into the landing page space for agencies? By far, I prefer using Elementor for landing page design and form submissions. It would be great to be able to design landing pages for clients in one account and push it out as a sub domain. Elementor is already used by thousands of marketing and design agencies as a leading tool for creating landing pages. You can easily export or import your landing page templates to any website. You can also publish landing pages to different directories and have it translated into subdomains. It’s a good idea for a tutorial, we might publish one soon. Keep your eyes peeled! Thanks Matan Naveh for Sharing Johnathan Secrets..